The VR sandbox casts you as a Giant Cop, pinching tiny perps. 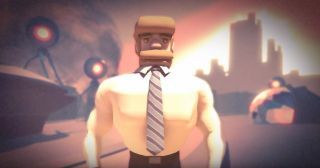 A new trailer for Giant Cop, the VR sandbox and satirically large law enforcement sim, arrested (the attention of) audience members during The PC Gaming Show at E3. It gives the citizens of Micro City their close up, playing a montage of monologues in which they describe how life has changed since that big and tall officer of the law showed up on the scene. As the Giant Cop, you’ll roam Micro City (which isn’t so micro, it turns out) and use the Steam VR controllers to pick up perps and pack them away, maintaining order in what is surely a free and happy society. Don’t forget to vote. Giant Cop is set to release later this fall.